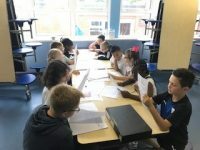 On Wednesday 18th July the children form the Mission Team met to look at the applications for this half terms Mission Awards. The children took the job very seriously looking carefully through each application and interviewing children to ensure that they met the criteria for their year group! We had a huge number of successful applications and the medals will be presented during assembly on Friday! This entry was posted on Wednesday, July 18th, 2018 at 9:57 am	and is filed under Catholic Life, Mission Team. You can follow any responses to this entry through the RSS 2.0 feed. You can leave a response, or trackback from your own site.